I gave a public lecture to a group of mostly retired Torontonians. Entitled, "Rob Ford and the Problem of Toronto Journalism," it began with my confession to this eager and curious noonday audience of about 250 concerned citizens. I confessed that this story, which I once thought of as a terrific opportunity for tough, investigative journalism, now profoundly depresses me. (Much head nodding in the audience). 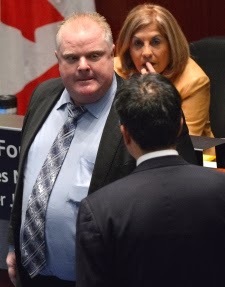 The appalling behaviour of Mayor Rob Ford, I explained, that has spread world wide, is not just a civic embarrassment. It also evokes feelings in me, that I find shocking and somewhat repugnant. This story bring out the bully in me. I am angry with Rob Ford. And it seems I am not alone. Many in the local media, especially columnists, have attacked not just Ford and his brother Doug, but his family as well. Some of the worst bullying has come from the newspaper that has been otherwise, so brilliant in covering this story, the Toronto Star. Two of the Star's most read columnists are Rosie DiManno and Heather Mallick. "I cannot take the Fords straight up. It is simply too appalling to read about them and watch them being interviewed and still accept that these people exist in real life. It's like one of those reality shows...and then realized that shows like Here Comes Honey Boo Boo and Hoarders are real and so are the Fords. (Toronto Star, November 8). "...there's nothing short of driving a stake through his heart that can compel him to (leave). In Gonzo Ford World, a parody of politics, this is posited as the man's strength of character. It is not. It's his pathology, his mania and there's no rehab for that. 'I really effed up,' said Ford. 'And that's it.' Oh, eff-off." (Toronto Star, November 5). The definition of a bully is "a person who uses strength or influence to harm or intimidate those who are weaker." That's been Ford's m.o. for years. Now it seems he's passed the virus along to us.